Yogi Govan knows men’s barbering – and everyone knows Yogi. It’s little wonder; Yogi is the fourth generation of barbers in his family, who have been catering to the grooming requirements of Cape Town’s gentlemen since the 1920s. Yogi’s great-grandfather, originally from India, set up a barbershop in the late 1800s in the Eastern Cape’s Uitenhage. 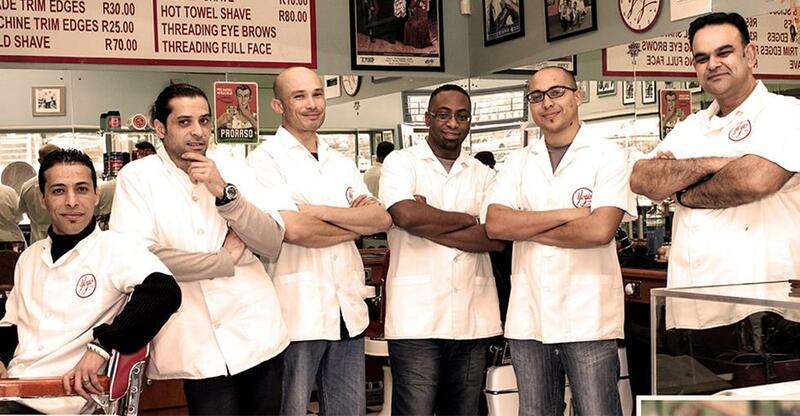 Taking the family business South, Yogi’s grandfather opened his first barbershop on Loop Street in Cape Town in 1929. He then moved to the bustling corner of Buitengracht & Dorp Street and opened Salon Harry in 1957. This is where Yogi and his brother learned the family trade and in 2006 they partitioned the business into a hairdressers and barbershop – Yogi taking on the barbering side. Ten years later and business is booming. Yogi’s is a classic barbershop (complete with stripy pole and traditional fittings) and attracts long-term regulars as well as a hip and ethnically diverse Capetonian clientèle. We spoke to Yogi himself to discover the secrets of a running a successful barbershop and his hopes for the future. It’s fair to say there’s been an explosion in the male-grooming market over the past decade and this has played into Yogi’s talented hands. One thing that is vital for a successful barber is the connection they make with their clients and the reputation that this engenders. Five minutes spent talking to Yogi reveals why he has become so popular; he is warm, courteous, engaged and engaging – all the attributes needed to keep customers coming back. A photo on the wall of Yogi’s barbershop pays testament to that: it is of a stylish elderly gentleman who has had his haircut by not only Yogi, but his father and grandfather before him. The iconic look of Yogi’s has also served it well. The 50s style black and white tiles, walls adorned with old photos and a suite of red antique barber’s chairs all conjure up the notion of old school customer service as well as a tinge of nostalgia. The shop is a honeypot for the media – and has featured in numerous magazine shoots as well as a cutting edge campaign for New Balance trainers; The Barber Shop pack. Cabinets in the shop display old barbering tools from ‘back in the day’ and Yogi and his barbers all wear matching white tunics giving the impression that they might, at any moment, move into a quartet formation and start harmonising. Just as the Slow Food movement caught the imagination of a modern generation tired of big, brusque brands – so the traditional barbershop with its image of service and the investment of time has had a real renaissance in recent years. Image aside, no barber can achieve long term success without a talent for male grooming. Yogi claims barbering skills can be learned, in some part, by practising on colleagues (he is a willing ‘guinea pig’ in the shop), YouTube videos as well has observing experienced barbers. Yogi would never have got where he is today without being passionate about barbering as well as having dreams for the future. With his infectious positivity and pride in his trade, something tells us Yogi’s dream might just come true.